Green lights dance across a star-filled sky. Snowflakes sparkle on the trees. It is little wonder Lapland is famous as a realm of elves and flying reindeer, the magical home of Santa Claus. Lapland, however, is a real place, where real animals and people live out their lives. It is Europe’s most stunning and challenging wilderness, every bit as magical as the fantasy. This film is an intimate portrait of Lapland through the changing seasons. It follows the magic and drama of life in the frozen north, long after the Christmas lights are taken down, and where only the toughest survive. Traditionally, Lapland is the region inhabited by the ethnic Sami and their reindeer. It makes up the northernmost part of mainland Europe and is composed of two main habitats – tundra and forest. The forest is the northwest extremity of the great Taiga, the largest area of any single habitat on Earth. Tundra covers the high mountains and stretches deep into the Arctic Circle, a vast, frozen wilderness. Winter is Lapland at its most recognizable. Snow blankets the land and northern lights flicker in the darkness. 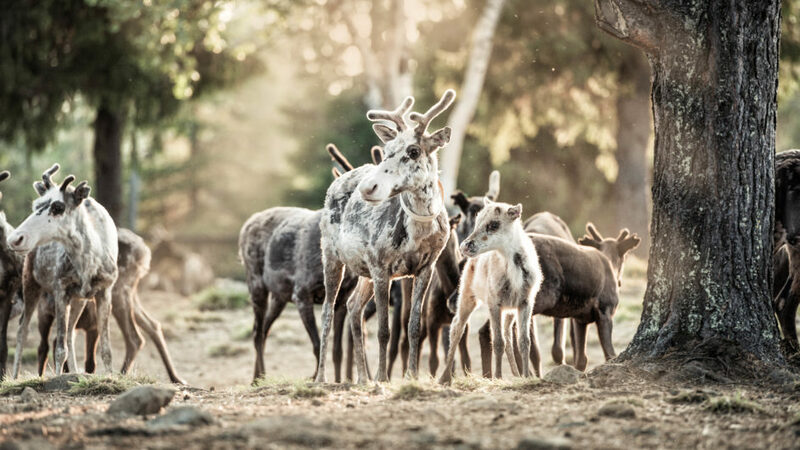 At this time, Lapland’s most famous residents, the reindeer, are separated into small herds by Sami herders. The great grey owl floats silently by, able to hear prey buried half a metre beneath the snow. Others survive by scavenging. A frozen carcass draws in wolverines, ravens and golden eagles. As spring and summer arrive, Lapland is transformed. The midnight sun sparks a frenzy of activity that will last just a few short weeks. Black grouse battle for females. Flying squirrels race to raise young in old woodpecker holes, while the great grey owl breeds in an old raven’s nest. Brown bears emerge from hibernation. It is a busy time for the Sami and their reindeer, as the herd migrates across the tundra and even crosses the ocean in search of grazing and calving lands. After just a few weeks, summer wanes and Lapland glows red with the colours of autumn. The musk oxen begin their dramatic rut. They clash horns with such force that it echoes across the tundra and can be heard up to a mile away. The reindeer must rut too, as well as head south before the land is locked in snow, ice and darkness once again. Santa’s home is famous the world over, yet few realise it is a real place. This visually stunning film will reveal a realm every bit as magical and dramatic as the fantasy. Lapland is Europe’s last great wilderness, a mystical, frozen kingdom in the far north.